The circadian rhythm is often associated with the biological sleep/wake cycle but what it comes down to is lighting. While sleeping habits are a large proponent to circadian rhythm studies, sets of research on the circadian rhythm and eating times show profound effects on the body’s metabolism. When it comes to the circadian rhythm, light is a major influencer. For example, once the sun sets and light exposure is reduced, your body secretes the hormone melatonin to facilitate sleep. Light isn’t the only factor that impacts the circadian rhythm however. The circadian rhythm can also be influenced by many other things, such as the timing of physical activity or the timing of eating. Research supports the notion that when you eat can influence your body’s processes and ultimately plays a big role in many aspects of your health. You may find yourself having a larger appetite in the evening than you do at breakfast time; rest assured you’re not alone. A recent study, conducted by researchers from John Hopkins School of Medicine in Baltimore, Maryland, as well as the Mount Sinai Icahn School of Medicine in New York City, looked into the causes of higher appetite in the late afternoon and evening. These findings were published in International Journal of Obesity. In the study, thirty-two adults aged 18 to 50, all of whom were overweight, participated in two experiments. In the first experiment, subjects were asked to fast for eight hours before receiving a moderately calorific meal at 9 a.m. In the second experiment, subjects were asked to fast for eight hours before receiving the meal at 4 p.m. In both experiments, approximately two hours after the meal was consumed, participants underwent a stress test that consisted of holding their hand in icy water for two minutes while the researchers recorded their facial expressions. After this stress test, the participants were offered a buffet of highly palatable foods such as pizza, chips and sweets. Researchers recorded the participants’ hunger levels, stress levels and actual hunger hormone levels throughout the experiments. In the end, they found that people felt the hungriest when eating a late 4 p.m. lunch after having not eaten all day. They felt much hungrier than when eating at 9 a.m., having fasted overnight. These hunger levels were reflected by higher or lower levels of the hunger hormone ghrelin. Another finding was that eating at 4 p.m. after having not eaten all day, made the subjects more susceptible to the effects of stress. The 4 p.m. eaters showed higher levels of stress hormones in their blood after the stress test than the other group. The takeaway from this study shows that skipping lunch and not eating at regular intervals throughout daylight hours has negative effects on stress tolerance and appetite regulation. 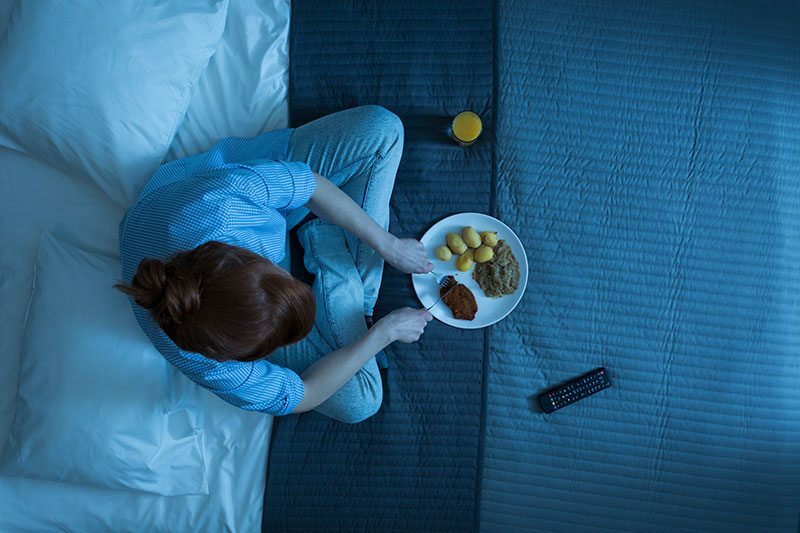 Beyond the question of when to eat dinner; late-night snacks or binge eating has also shown negative health outcomes. This is not only due to nutritional factors, but also due to how this type of eating disrupts the circadian rhythm. Research from the National Autonomous University of Mexico, located in Mexico City, demonstrates this in a study conducted altering rats’ eating schedule. For this study, researchers fed one group of rats during their normal waking hours, and provided food to another group of rats only during their normal sleeping hours. What they found was that the rats who were only fed when they would normally be asleep experienced a rise in their blood triglyceride levels, an effect that was not present in the other group. So why the concern with blood triglyceride levels? High blood triglyceride levels are associated with major health problems such as diabetes and heart disease. The results from this study suggests that nighttime eating could potentially raise these levels and thus increase the risk of these health maladies. In addition to the increase in health risks from nighttime eating, because of nighttime eating’s effects on circadian rhythm, eating after dark makes you gain more weight than eating the same amount of calories during the day. This correlation between eating times and weight gain has been demonstrated in studies conducted on animals. For example, in one study, mice who were fed only during the 12-hour light period of the day gained significantly more weight than mice who were only fed during the 12-hour dark period. Keep in mind that since mice are a nocturnal species, the effect of this would be reversed in humans, making daytime the optimal eating time for avoiding weight gain. As we have seen, when the circadian rhythm is disregulated, a wide range of negative health effects can occur. Looking into yet another aspect of our health that is affected, circadian rhythm disruptions can have significant negative effects on cognition as well. According to research, one study conducted included one group of mice that were fed during their normal active hours and another group that were only fed during their normal sleeping hours. After a few weeks on this feeding schedule, the mice underwent learning and memory tests. The scientists found that the mice who ate out of alignment with their circadian rhythm were significantly worse at learning and memory-related practices. So, How Late Can I Eat? To avoid these negative effects on your health, it is vital to ensure proper eating times and avoid late night meals. In an attempt to find key hours for optimal eating schedules, one study found that when your body is aligned with its most natural circadian rhythm, hunger levels are lowest at 8 a.m. and highest at 8 p.m. The low hunger levels of the morning make evolutionary sense; after all, if it were typical to be ravenously hungry at 3 a.m., no one would get much sleep! Your natural hunger levels start declining at 8 p.m. Therefore, it would be prudent to have your last meal or snack of the day well before this time. Other sources suggest that one should allow a 12 hour fast between your last meal of the day and the time you normally wake-up. Another guideline could be to not eat after dark, as the decrease in light signals to your body to start winding down, and eating past this point will only serve to stimulate your body. Use whichever of these guidelines work the best for you; they may all provide similar benefits.